Last week, the City of Vancouver began implementing an ambitious plan to plant orchards in city parks. The apple, cherry, plum and pear trees will be cared for by young people from nearby schools and are part of a long-term project to create and edible urban ecosystem. It’s a great idea. Let’s turn all our parks into productive as well as recreational spaces. I have my doubts, however, about the use of child labour. I distinctly recall a number of “taking ownership” conversations in our own house over the years, chiefly around things like walking the dog, feeding the dog and the cats, weeding the garden, bringing dirty dishes back to the kitchen, shoveling the snow and doing homework, just to name a few. If we had relied on our kids to take “ownership” we would now be facing animal cruelty charges, eating nettle salads off paper plates, using ice-climbing gear to get down the front steps and preparing our beloved offspring for minimum-wage careers at the local call centre. I note that Mr. Manning did not suggest for a second that the children would actually eat the fruit. That would require too much suspension of disbelief. If my own children are typical (and all the other parents down at the support group suggest they are), growing fruit is a waste of time. Growing potato chip trees would be more like it (especially if they were those really good flavours like ketchup or dill pickle). Given my own track record with child-rearing, I can be of no assistance to Mr. Manning as he attempts to turn students into stewards but, I can offer the good citizens of Vancouver some advice about what to do with all that uneaten fruit. 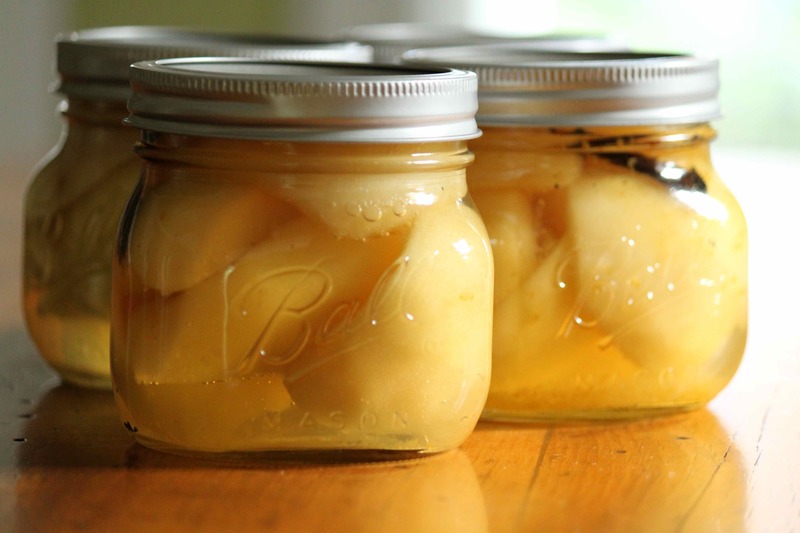 A little bit of brandy gives these preserved pears an adults-only kick. Serve them with double-chocolate chevre ice-cream (we get ours here) and you’ll be happy the kids went for the chips instead. This recipe is adapted from my favourite preserving book, The Complete Book of Small Batch Preserving by Ellie Topp and Margaret Howard. It is my go-to source of inspiration when I have a counter full of fruit I know won’t be eaten. I added a vanilla bean to this recipe for a little extra flavour. Prepare the fruit and immerse it in the 1/4 cup of lemon juice mixed with four cups of water to keep it from turning brown. Set aside. Place clean jars in canner full of hot, but not boiling water until ready to use. Place lids (but not screw bands) in a small pot of very hot (not boiling) water for a few minutes to soften seal. Grate lemon rind into a medium saucepan and add 2 tablespoons of lemon juice. Add water, sugar and vanilla bean and bring to a boil over high heat, boiling gently for 1 minute. Add 2 tablespoons of brandy into each clean, hot, 1 pint (500 ml) jar and add drained fruit, packing tightly. Place one piece of vanilla bean in each jar. Add hot syrup leaving 1/2 inch headspace. Check for air bubbles and remove any using the handle of a wooden or plastic spatula (don’t use metal). Readjust head space to 1/2 inch if required. Wipe rim. Center lid on jar. Screw band down until resistance is met, then increase to fingertip-tight. Place jars in canner, ensuring they are completely covered with water. Bring to a boil and process for 20 minutes. Remove jars, cool on the counter for 24 hours, check seal (keep any that haven’t sealed in the fridge and enjoy them over the next few weeks) and store in a cool dark place for up to one year. This entry was posted in Desserts, Preserves and tagged brandy, pears, preserves, small-batch preserving. Bookmark the permalink. I had never heard of chevre ice cream, but now I *must* have it. I’d guess it’s expensive to have shipped to Los Angeles. I hope my search for a local vendor is fruitful (or should I say brandy-pearful, silly joke). As god as my witness, I won’t rest ’til I get my hands on a pint. And like Scarlet Ohara I’ll never be hungry again. Maybe I’m being a bit dramatic. What can I say? It’s always good to have a food quest! Let me know how you make out. I got coffee-flavored goat milk ice cream from Whole Foods tonight. I don’t know if it’s the same thing as chevre ice cream, but I’m very much enjoying it. The only distinct goatiness to it is a mild, fleeting aftertaste. I think I’d like it with greater pungency, and am inspired to taste test a multitude of brands. It’s not quite the same, I’m afraid. I now have an ice-cream maker and will attempt some chevre ice cream soon. Stay tuned.